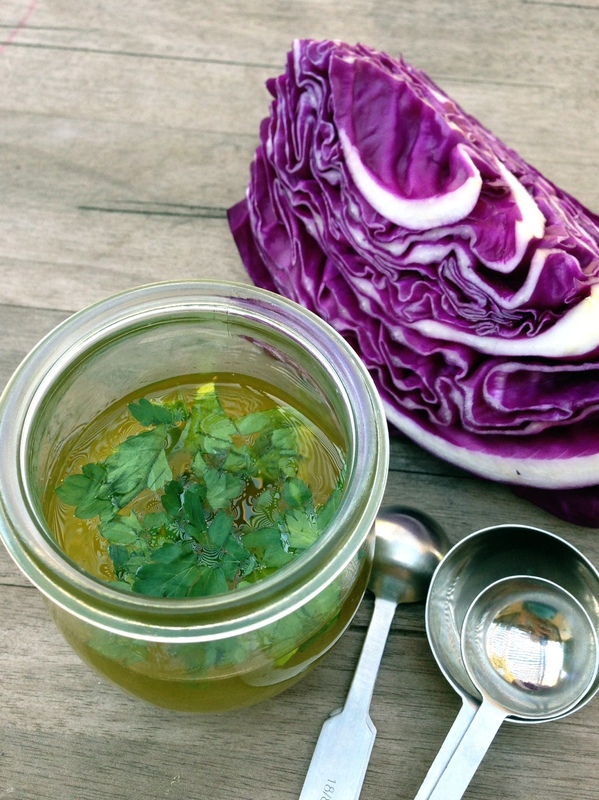 Late winter is perfect for cabbage and winter slaws. I planned ahead and planted both and used most of my cabbage heads for fresh salad and for topping fish tacos. This version of the Greek Slaw is what I grew up with in my household. Mayo dressing was not an option. I can never remember having it in our refrigerator. This is the beginning of Great Lent in the Orthodox religion and a simple meal such as this is prepared for a light lunch or as a side. What makes Greek slaw salad so different than the American version is the dressing. We use a simple olive oil dressing with fresh lemon. What makes this salad pop with flavor is using a premium extra-virgin olive oil and fresh lemon juice. (not that bottled stuff). An apple-cider or red wine vinegar can be substituted from your pantry in place of the fresh lemon. And that’s one thing I love about the Greek Diet, recipes are easy and fast, using whatever ingredients you have on hand! Pictured above is my red cabbage I grew and just picked for this recipe. 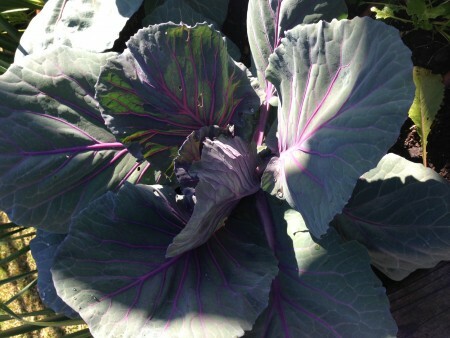 Not only is this cabbage so fresh and flavorful, but the leaves are large and majestic in your garden! 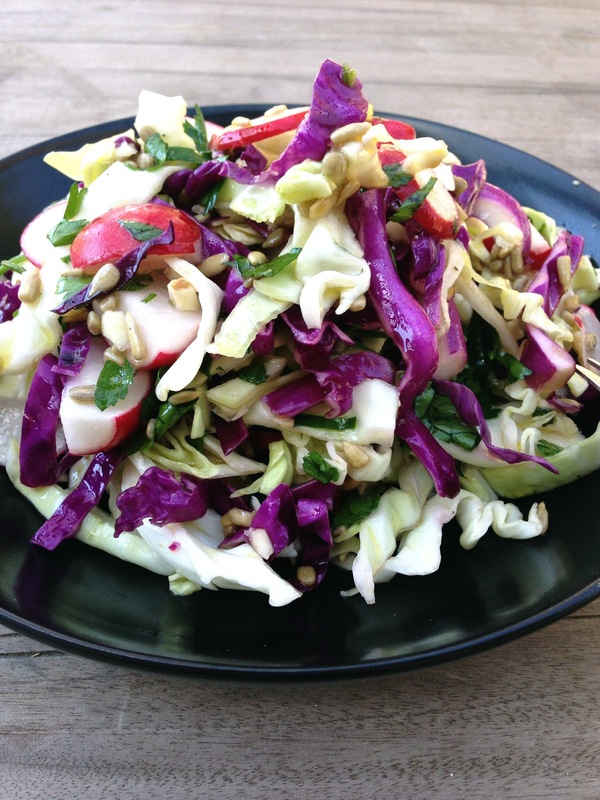 This refreshing slaw can be made year-around with the simple traditional oil-lemon dressing. Dress it up with your choice of nuts, dried fruit and additional vegetables.And don't forget to add red and green cabbage to your garden list next year. Add the radishes, nuts,and parsley. It can be covered and refrigerated at this point. Combine the olive oil, lemon juice, garlic,salt and pepper. Shake to mix. Before serving add the dressing and mix thoroughly..
Additional options: Add shredded carrots, celery, apples, dried fruit, and nuts. This slaw is a wonderful salad for a BBQ or a large gathering, because it can be left out without refrigeration. This can be assembled the day before without the dressing. And don’t forget to add this to your Meatless Monday list of quick family recipes. Making your own dressing is so rewarding. Start out with a bottle of fresh extra-virgin olive oil and add your favorite spices. This gives you, your very own signature salad! © 2014 – 2015, Mary Papoulias-Platis. All rights reserved. Hi, I love your site! The recipe says sesame seeds, but the picture looks like sunflower seeds. Which did you use? Yes, both can be used! Thanks for the correction.